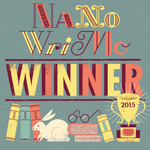 This morning I crossed the 50,000 word finish line for NaNoWriMo. I just missed this goal last year, so this year's win is doubly satisfying. It was a close call there again this year, because as usual, I missed three days in a row and fell behind in the first week. My daughter's homeschooling report is due on the 7th of November each year, and no matter how much I say I'm going to get it out of the way early, I never do! So I nearly always miss those same three days. But in spite of this, I made my goal, and I now have 50,000 new words on Reckless Remedy. So how did I do it? 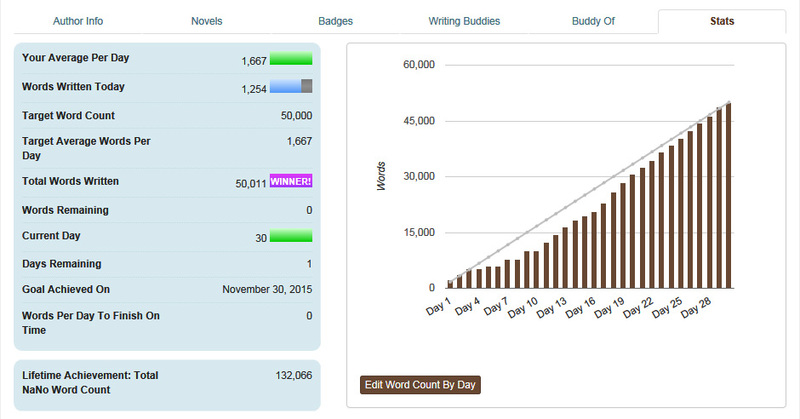 How did I catch up those missed 5001 words? I'll let you in on a little secret. You don't have to catch them up all at once, or even over the course of the week. If you've ever done NaNo before, you'll know that the graph gives you an average daily goal of 1667 words a day, but at the bottom of the stats page, it also tells you how many words a day you'll have to write to win, given where you're up to now. Make sure you check it before you enter any words for the day though, because it goes down as you add your wordcount during the day. See that ‘Words Per Day To Finish On Time' section? Yeah, that one. If you write that many words a day, you'll still win, even if you're behind. And even missing 5k at the beginning of the month is only a few hundred words a day extra. As you can see, I remained behind the entire month, until the second last day. And you know what? It didn't matter. I still wrote 50k in the end. I think I had an average of 1900 words on my highest days, but since I aimed for 2k most days, I slowly and surely caught up over the month, until I only had to write 1250 words on the last day. That said, even if I hadn't technically won, I would still count it as a win. All words written are a win, because you can't edit a blank page!